Rory McIlroy might be playing like the teenager but there’s plenty of mature method to his long-bombing madness at Carnoustie this week. The Co Down man has often been criticised for dubious course management and a strong stubborn streak. But after opening with a two-under 69 to lie just three strokes behind first-round leader Kevin Kisner, he plans to stick to his aggressive game plan and strut down the fairways like the 18-year-old who won the silver medal here 11 years ago. "Yeah, didn't see the fairway much, but as I said at the start of the week, it's very playable from not in the fairway," McIlroy said of a round that saw him make three birdies against one bogey despite hitting just four fairways. The key was not that he had just 26 putts but that he avoided most of the punishing Carnoustie bunkers. "As long as you don't hit it in the fairway bunkers, you're always going to have a shot at the green," said McIlroy, who ended the day tied for eighth with the likes of Jon Rahm, Justin Thomas and Danny Willett on two-under. "That's why I tried to stay as aggressive as I possibly could even though I wasn't hitting the driver maybe as well as I could." He missed fairways often because deliberately played for one side or the other so he could better attack pin positions tucked near the edges of greens. "You know, it wasn't pretty off the tee, but I got it done, and I took advantage of some fortunate bounces,” said McIlroy who birdied the third and bogeyed the fifth, then picked up shots at the 12th and par-five 14th before saving par from around 25 feet at the 248 yard 16th. “I would have taken 69 to start the day. Even if you play aggressive around here, you might make more bogeys than playing it safe, but you're going to make more birdies as well." Kisner bogeyed the fifth but eagled the sixth and added four birdies to shot a five-under 66 and lead by a shot from Tony Finau and South Africans Zander Lombard and Erik van Rooyen, the bearded 54-hole leader at the Dubai Duty Free Irish Open two weeks ago. But it was a mixed day for the world’s leading players with Justin Rose and Jordan Spieth shooting one-over 72s and world No 1 Dustin Johnson a 76 after his triple bogey at the last. US Open champion Brooks Koepka went out on five-over 41 but rallied for a gutsy 72, which was just one more than Tiger Woods who cruised through the turn in an immaculate 34 before fading to a level par 71. As for the Irish, Paul Dunne’s magical short game helped him par the last three holes and post a level par 71 that was nothing less than he deserved. “Through 15 holes I could have been two, three under and even a few lower," said Dunne, who bogeyed the first and ninth but made tap-in birdies at the second and 12th. While Shane Lowry brilliantly scrambled for pars on the 15th, 16th and 17th, he was utterly downcast after making too many self-inflicted mistakes in a three-over 74. His round was defined by a double-bogey six at the 10th, where he had just a wedge to the green but went over the back and took four to get down from there with the putter after his first attempt rolled back to his feet. "From 104 yards to make double... in a tournament like this it's just such a kick in the you-know-what,” Lowry said. “You can't really expect to try and compete. "I felt like I played okay, but made too many mistakes. Just not good enough. Pádraig Harrington, the defending Carnoustie champion, was one under after eight holes. But as his concentration waned, the wind switched and the greens deteriorated, he bogeyed the ninth, 10th, 12th and 16th before he found the Barry Burn at the 18th and closed with a double bogey for a 76. “It was a disappointing finish," said Harrington, who did not putt well coming home. "You’ve got to kind of hang in out there and hope to make a few birdies every now and again. “Things were going nicely for me and then I lost a bit of focus around the turn when the wind changed and then dropped three shots at nine, 10 and 12. You know, not great when you’re not seeing too many birdies. 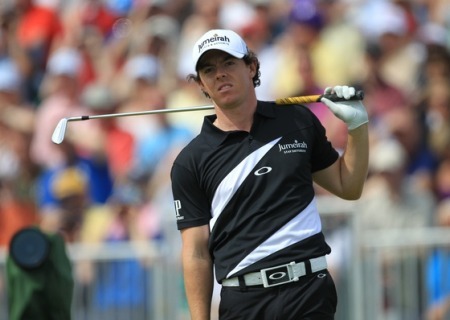 Rory McIlroy reacts to his tee shot at the fifth. Picture Fran Caffrey www.golffile.ieRory McIlroy hoped for a scorching day by the seaside but ended up totally frustrated by another major flop.